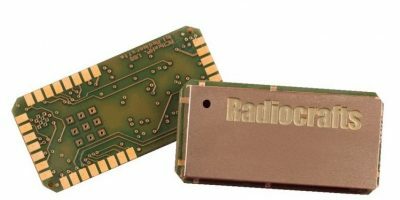 A wireless IP mesh based on fully integrated RF modules has been created by Radiocrafts. A new family of RF modules form a complete wireless IP mesh for long range IoT access. The RIIM (Radiocrafts Industrial IP Mesh) uses 6LoWPAN, a lightweight version of IPv6. This allows the user to access each sensor and controller from the internet using IP addressing. The radio protocol uses IEEE 802.15.4 g/e providing bi-directional communications with short transmission pulses that enables dense networks with high reliability and very low power consumption. RIMM will enable customers to get to market quickly, based on Radiocrafts’ compact RF module as the foundation, simple set-up and a novel way to interface any sensor or actuator, the Intelligent C-programmable I/O (CIO). Customers can create complex applications managing and interfacing sensors and actuators in less than 100 lines of C-code, removing the need for an external microcontroller in the devices, advises Radiocrafts. The Wireless IP Mesh does not require any license or subscription, and is very low power. It operates at 868 or 915MHz frequency and is based on a mesh network topology, using IPv6 to address each leaf node. It can support several hundred nodes in a network, reveals Radiocrafts, yet has very low power consumption; it offers a five-year lifetime on a 2000mAh coin cell battery. The universal sensor/actuator ICI interface means that no external microcontroller is required. The network range is up to 20km and up to 29 mesh hops can be supported. Ethernet access to the RIIM network is via the Radiocrafts border router. The network is cloud-compatible via the CBOR protocol.